I’ve been impressed by the wind for as long as I can remember. Sometimes I hated it (hard, cold wind in the winter) and sometimes I loved it (cool breeze on a hot day), and sometimes I’ve just been in awe of it, with a little fear thrown in (hurricanes, tornadoes). I’ve sat on my roof watching fierce winds blow dark storm clouds over like they had someplace really important to go, and it felt just magnificent! 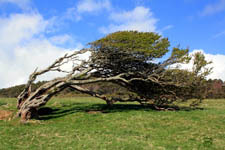 The wind is incredibly powerful! But since I learned that the wind actually has a spirit, I’ve also spent a lot of time talking to the wind. Usually asking it for a favor! On hot summer days in Texas, when the temperature would be up around 100, I would ask Brother Wind to please blow for me, just a little breeze, just enough to cool things down just a little, boy that would sure feel good if you would just do that for me… Sometimes it seemed to work and sometimes it didn’t. And in the winter, when I was outside in the cold, and the wind made it seem even colder, I would ask Brother Wind to please not blow so hard, just for a while, just hold off until I can get inside out of the cold… And I had been told that a little flattery goes a long way when talking to nature, so I always made sure to tell Brother Wind how much I admired him and how powerful and awesome he was! But always, the result was the same: Sometimes it seemed to work and sometimes it didn’t! I never knew for sure that the wind even heard me. But that didn’t matter, I never stopped asking. After we moved to North Carolina, I was out walking one winter night, and it was cold, but it was also so beautiful! We had moved to such a beautiful place, and I was enjoying the walk, and the trees in the moonlight, and the stars. I was feeling nature all around me, and I was just feeling good! The wind came up, and it was cold, and on reflex I started to ask it not to blow. “Brother Wind,” I said… And in mid-sentence, I realized that, cold or not, the wind blowing in my face felt just wonderful, just like everything else around me. Sharp and cold and wonderful. Magnificent! And instead of asking it to stop, I said, “…Hello. Just, hello. How are you? Boy, you’re really in fine form tonight!” No favors needed, no requests to make, I was just saying hello, I appreciate you. And I felt the wind smile at me! Contact at last!